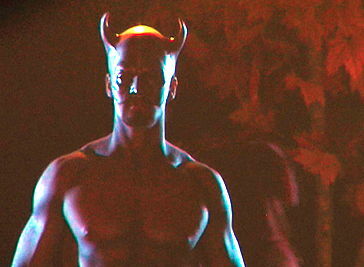 There is is bizarre trend on the internet of making horror movie villains into "gay icons". First there was" the Babadook "and now it's Penny Wise the evil clown from "It". There is nothing gay about either one . Penny Wise manipulates children and kills them- oh yes that is my type of gay icon! Who starts this non sense?! People who don't like horror movies and want to appear cool? I saw a headline somewhere recently about The Babadook becoming a "gay icon", but I didn't click on it, as it seemed like click-bait garbage. 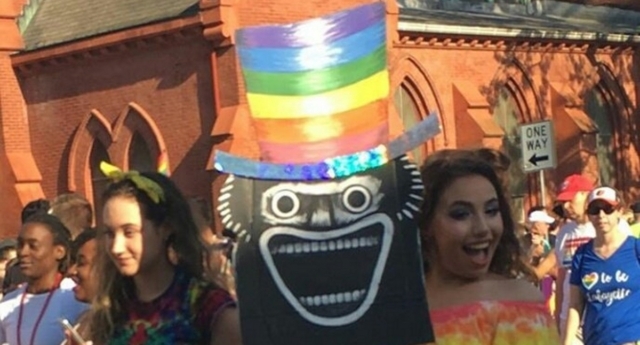 I enjoyed The Babadook, but I have no idea where they could be coming from with the gay angle. Sounds like people who don't like horror movies OR gay people. It makes more sense now, after reading the New Yorker column. It started as a bit of a goof, and then snowballed, as these things do, into an actual phenomenon. And there's the universal theme of monster-as-outsider that can align with any repressed or socially stigmatized sub-group. I wonder if a lot of people will change their minds about the movie. How so? Do you mean will viewers interpret the movie differently if they go into it with this new association? I'm sure they would. I don't know if they would like it less or more, as that would depend on the viewer. I don't think I'll see it differently. I liked the film enough to rank it in my top ten for that year. Yes, that's what meant, but I've reread my post and now I think I underestimated a great deal of the audience. Me, I saw it once when it opened and I don't remember much about it. Thank you for the summary and the link to the trailer. I remember the premise of the movie, perhaps I should have stated that, but I saw it three years ago! I vaguely recall a couple scary scenes -which are included in the trailer, but in the end I was disappointed. As with It Follows​, I thought the movie delivered occasionally, but not as a whole. Since the movie seems to be so popular on these boards, perhaps I should try to watch it again. I really enjoyed It Follows, as well. I should say that I watch a lot of horror films, and while it's perhaps my favorite genre, I'm excessively critical of it, and very seldom find newer films that I enjoy. These two are notable exceptions. The main problem I saw in It Follows and The Babadook ​is that they worked hard to transcend the characteristics of the horror genre to give them a deeper meaning to their stories and, in my opinion, it didn't work. Of the newer films, I liked The Witch and The Autopsy of Jane Doe. Ha! I really liked those two, as well. The Witch made my personal top ten of its year. I've seen all four films and liked them all for different reasons- " The Autopsy of Jane Doe" is the most surprising and a must see- if you like horror. I saw The Autopsy of Jane Doe because you highly recommended it in the Horror thread and I liked it, too. I just saw the bizarre "Love Me Deadly" (1973) a movie about **** starring Lyle Wagoner of all people. He is married to Lindsay ( Mary Charlotte Wilcox) who finds dead guys attractive specially if they remind her of her late father. She joins a cult run by the bisexual mortician Fred (Timothy Scott) who at one point picks up a hustler and embalms him alive. Christopher Stone who would later appear in "The Howling" co-stars. You can see it on you tube.